The war of the end-of-times has just broken out on Earth. The armies of heaven and hell clash,their supernatural battles tearing the planet apart. The only problem is the war shouldn’t have started yet, and you, one of the four horsemen of the apocalypse, have been accused of breaking a sacred agreement, prematurely igniting said apocalypse, and ending mankind. Oops. Darksiders, the hit post-apocalyptic action game from Vigil Games for Xbox 360 and Playstation 3, has arrived on the PC and now the Mac, thanks to the OnLive gaming service which lets you play a growing number of games on your Mac, PC, or TV without having to download or install the actual game. All you need is a good Internet connection and a small client from OnLive, as well as a driving urge to fight evil or, in some cases, embrace it. In Darksiders, you play as War, the first horseman of the apocalypse. Stripped of your powers for your supposed betrayal and banished to the post-war wasteland that is Earth, you now have the option to unravel the mystery of what happened, reclaim your powers, and clear your name. Or you could just get devoured by one of the lingering demons. Choose wisely, but don’t worry about humanity: it’s long gone already. 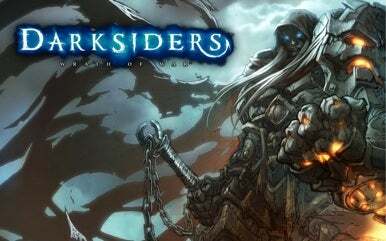 I bought Darksiders when it came out for PS3 and had a blast. The gameplay is extremely similar to the infamous God of War series, but the unique story and very open-ended world made for a refreshing experience. There is a strong variety of options for upgrading and customizing your weapons, and Vigil did a great job of designing a deep, detailed, and strangely beautiful Earth that was ravaged by heavenly and hellish war. OnLive’s service is free for the first 12 months, after which the company charges a $5 per month membership fee. You can then purchase either a limited “PlayPass” for games—some as cheap as $4 for three days of access—or a Full PlayPass with unlimited access time that’s closer to the full retail price of the game.